At the first glance, three giant fingers abruptly sticking out of the ground may seem like one of those modern, quirky art installations. But when we consider the context of the very site, the history aficionados among us can comprehend and appreciate the sheer scale of this contrivance that harks back to the ancient times. In that regard, the site in question pertains to the mysterious (and massive) presumably Roman-built Temple of Hercules, perched on a hillside overlooking the city of Amman, Jordan. 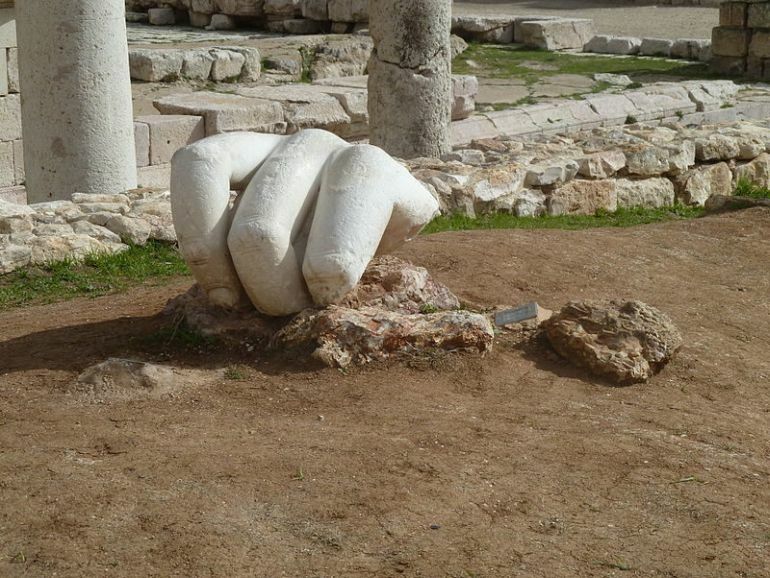 In terms of the physical evidence of this Hand of Hercules, till now archaeologists have been able to salvage the three fingers (pictured above) along with a portion of the elbow, with both of these segments being currently exhibited at the present site. In essence, the sections most likely belonged to a much larger marble statue of Hercules that adorned the main temple, possibly constructed in circa 162-166 AD, during Marcus Aurelius’ Roman occupation of the area. 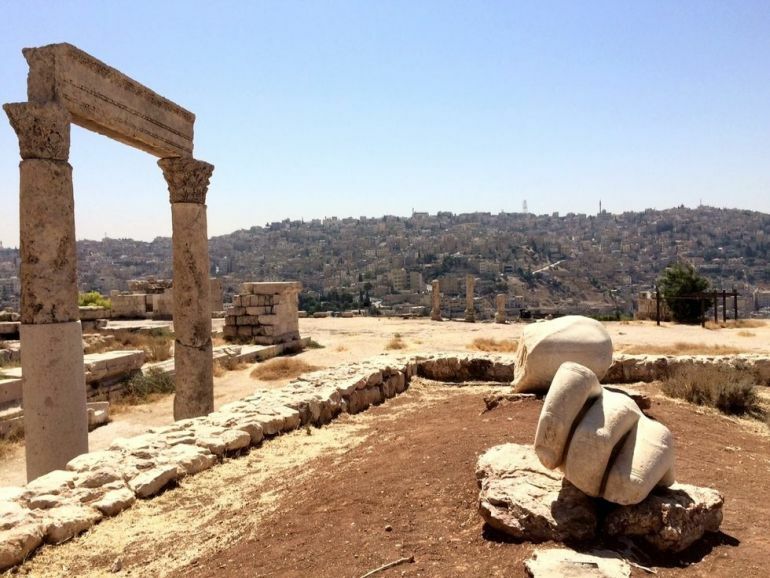 Amman, the present-day capital of Jordan, boasts its vibrant historical legacy shared by numerous ancient cultures ranging from the Phoenicians, Greeks to Romans and the Ummayads. The L-shaped defensive hill of Amman Citadel (locally known as the Jabal al-Qal’a) stands testament to these flurry of habitation and building patterns that started way back in the Neolithic age – so much so that the elevated neighborhood is often counted among one of the world’s oldest continuously inhabited places. To that end, many of the ancient ruins are located within the perimeter of the Amman Citadel, including the aforementioned Temple of Hercules, built by the Romans. 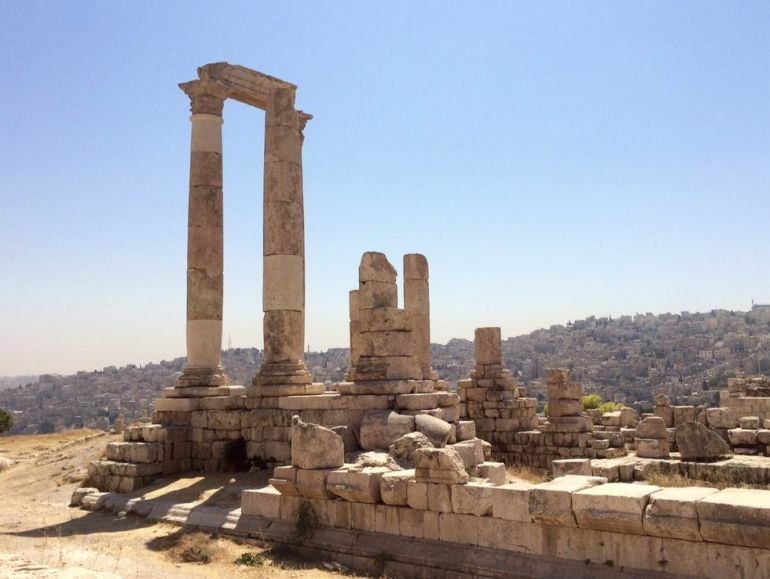 It should also be noted that Amman, known in the ancient times as Philadelphia (named so by Ptolemy II Philadelphus, the Greek ruler of Egypt), was one of the cities that joined the famed Decapolis League – an economic federation of numerous towns in Levant that commercially thrived during the Roman occupation in circa 1st century AD. During this epoch, the Romans furnished many buildings inside the settlement of Philadelphia, including the Roman Theatre, the Odeon, and the Nymphaeum. 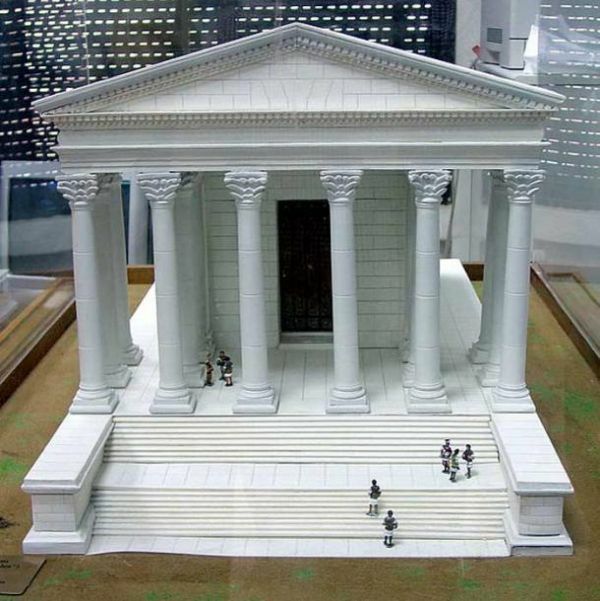 Unlike its Roman structural counterparts, the Temple of Hercules is not well preserved, a condition that rather accentuates the enigma of the structure. In any case, the archaeologists have estimated that the temple sanctum measured 400 by 236 ft (or almost 95,000 sq ft – which is 1.7 times the size of an American football field), while the core building itself was 100 ft long and 85 ft wide, which makes it larger than any comparable temple structure in Rome itself. Furthermore, its eastern portico still flaunts the remnants of six columns that rose to a height of 33 ft. However, the relatively unadorned nature of the rest of the building, in spite of its great complex, alludes to the hypothesis that the temple was not completed (and even left abandoned). Quite intriguingly, some scholars have suggested that this particular Roman religious building was constructed on the site of a far older precinct dedicated to a native god. 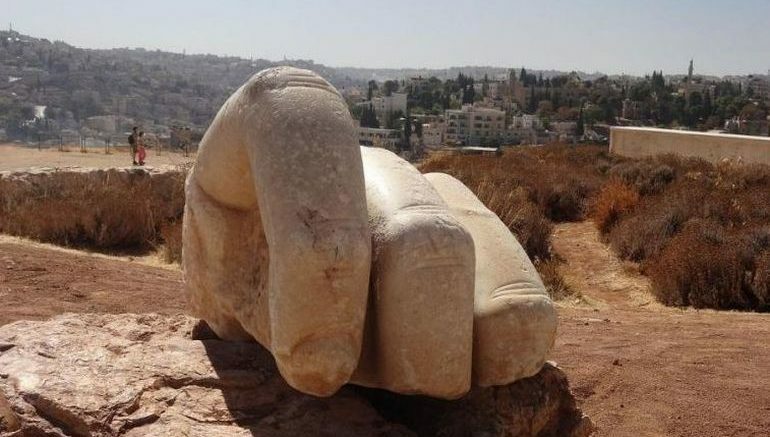 A bare rock patch found inside the temple’s inner sanctum hints at such a scenario, with the Amman Citadel possibly also housing the Ammonite Temple of Milcom (known also as Moloch) dating from 9th century BC. Where is the entire colossal statue of Hercules? Other than the aforementioned fingers and elbow sections, researchers have only discovered a few coins that marked the possible spot of the statue. But unfortunately, till now archaeologists have not been able to find another fragment of this massive statue of Hercules. The reasons, according to researchers, could be many. The probable scenario relates to how the area is prone to periodic earthquakes, and one of them could have played its catastrophic role in toppling the statue, thus mirroring the fate of the Colossus of Rhodes. The resulting fragments of the marble Hercules were possibly then used by the locals (during the contemporary period) for other proximate building ventures. Nevertheless, judging by the sheer size of the fingers alone, the researchers have estimated that this particular ‘lost’ specimen may have accounted for one of the largest marble statues in the world, with its height reaching around a substantial 43 ft.